WhiteHouse.gov immediately wiped pages on LGBT rights, civil rights, climate change, and health care from its “issues” section after Donald Trump took the oath of office. Sad. Sad. Sad. 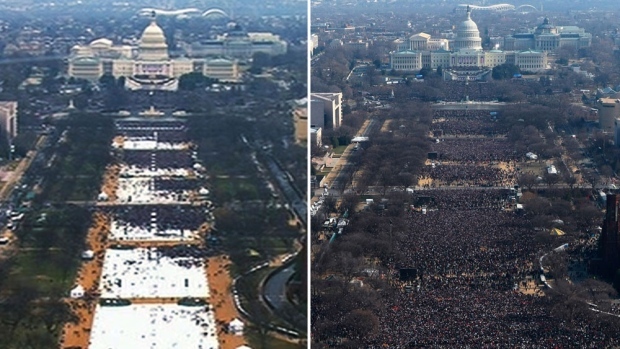 CNN had photographs of the crowds at the National Mall comparing Trump’s crowd during his oath [just after noon] versus Barack Obama’s crowd in 2009 at an unknown time. Clearly Obama won. Some estimates put Obama’s crowd at 1.8 million. Obama had temperatures in the 20Fs while Trump had his in the 40Fs. As of 11am, Metro [transit] ridership was 513,000 for Obama and just 153,000 for Trump. Other examples was Obama in 2013 at 317,000 and George W. Bush at 197,000 in 2005. Metro, Washington’s subway system, tweeted Saturday’s women’s march there were 275,000 trips taken Saturday by 11 a.m.
“I made a speech. I looked out, the field was, it looked like a million, million and a half people. They showed a field where there were practically nobody standing there. And they said, Donald Trump did not draw well,” Trump said. He also called the media liars for fabricating the totals. As if he is a crowd numbers expert! Trump’s team call it Alt-Facts according to Kellyanne Conway. Even press secretary, Sean Spicer, claimed that it was the biggest crowd ever for an inauguration. Who are they kidding? In the U.S., Nielsen estimates 31 million viewers watched TV coverage, but that’s less than Barack Obama’s [38 million] and Ronald Reagan’s first inaugurations. Trump tweeted his was higher than Obama’s second inauguration but failed to mention Obama’s first. I didn’t watch the inauguration at all except the odd 10-15 seconds here or there but I wonder if any of the national coverage including show the many protesters as the motorcade went by. The National Mall’s administration were told to remove the tweets related to the number of people attending the 2009 and 2017 inauguration. During the 2009 and 20013 inauguration as Obama went by the Canadian Embassy to Congress, the 3 RCMP Mounties in front of the embassy saluted. When Trump went by, no salute. Someone at the embassy said they were too close to each other to salute. Looked that way on video. Trump was at it again on Twitter. He’s taking credit that he has created jobs when companies have said the jobs created have nothing to do with him and were ongoing. When a NBC Today correspondent said that Trump’s impact on job creation “(according to the companies we hear from,) it is very small or nonexistent,” Trump went on a rampage used his standard “fake news” comment and saying that “No wonder the Today Show on biased @NBC is doing so badly compared to its glorious past. Little credibility!” In fact, NBC is #2 in the morning shows and #1 among 25- to 54-year-olds, the key demographic for advertisers. At the CIA, in front of the wall that honors those who died while serving their country, Trump lies say that he never had anything against the CIA or intelligence community. He then rants about the media. The outgoing CIA director had some not so kind words for him. Meanwhile far-right/alt-right site Breitbart News has a running list of announcements titled “Trump Jobs Boom”. That’s more like “fake news”. Meanwhile, GM to lay off 2,000 workers on inauguration day. For that, I’m sure Trump will blame it on Obama. That is 1,200 workers in Lordstown, OH and 800 in Lansing, MI. Trump not rescuing their jobs. Trump thanked GM this week after GM said it would hire and “retain” 2,000 in the coming years. So that doesn’t mean just 2,000 hired. An additional 1300 GM employees in Detroit will lose their job in March. “Americans to Trump: Enough With the Tweets,” the headline said, citing a new NBC/Wall Street Journal poll. According to the poll, 69% of Americans are wary of Trump’s Twitter habit. Trump said in an interview on “Fox & Friends” that he doesn’t “like to tweet,” but has to use the social network to respond to the “dishonest media.” Ha. Ha. Ha. Why doesn’t he let one of his stooges respond then. Seeing that the quality of acts at the inauguration concert was razor thin, Azealia Banks stepped in. Still didn’t help much! From the bookies, they say there is anywhere between a 20% and a 50% chance Trump will be impeached in his only term. A 500 to 1 chance that Trump will repaint the White House gold. Vladimir Poutine says Trump would never try to coax a contestant that Trump had helped organize because while they are beautiful but “low class”. Nice. Rudy Giuliani has been tapped to “lend expertise” and to advise the Trump administration on cybersecurity. The former New York mayor “will be sharing his expertise and insight as a trusted friend concerning private sector cybersecurity problems and emerging solutions developing in the private sector,” said a brief statement from the incoming Trump administration. Giuliani is the chief executive of his own private-sector cybersecurity venture, Giuliani Partners. After leaving office as mayor of New York at the end of 2001, this venture claims to offer “a comprehensive range of security and crisis management services.” His consulting firm has hired controversial staffers, and has worked for questionable clientele, reports have said. The company seems to be raking it in for a company that nobody knows what the company actually does. But it is raking in money. Unsure for what. Reminds me of money laundering or fraud. Money comes in but no work done others than something with the 2016 Olympics. A report from Canadian real-estate agency Royal LePage suggests many Americans who oppose incoming president Donald Trump continue showing a desire to purchase property in Canada. The company says U.S. traffic on its website surged 329 per cent the day after the U.S. election Nov. 8 and climbed 210.1 per cent year-over-year the week after Trump’s victory. For all of November, says Royal LePage, U.S. traffic to its site grew 73.7 per cent over 2015 and rose 40.9 per cent annually in the fourth quarter. During that three-month period, the report says U.S. interest in real estate was primarily focused on Canada’s largest markets, with Ontario, B.C. and Quebec receiving 72.7 per cent of all U.S. regional page views. Three-quarters of the American inquiries concerned residential properties. Not surprising, a contradiction for the Trump Organization. A month ago Trump vowed to do “no new deals” while in office. Now his company will still pursue US deals – but he won’t control the company. Bookies are taking odds or chances of whether he will be impeached in the next 4 years. Anywhere from 20% to 50%. The highest pay-out with the lowest odds is 500/1 from Paddy Power – if the Republican paints his entire White House gold. In the days after Donald Trump’s election, stores in midtown Manhattan watched a stream of foot traffic slow to a trickle as gates went up and police officers fanned out. Security restrictions near Fifth Avenue’s gilded Trump Tower have eased somewhat since then, but small businesses and people who live nearby are still worried about four years of inconvenient detours. Odd fact: The top states for pain killers and the top states for heroin users were all Trump winning states. Oh. If you haven’t noticed. I haven’t called Trump by his title….